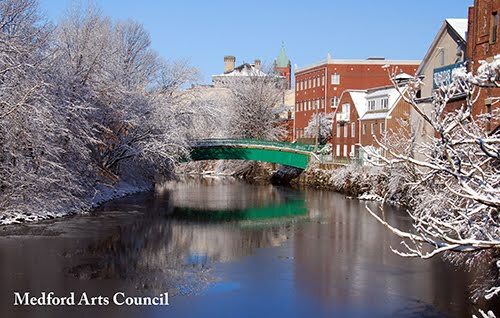 In 2010, I set up a new postcards program for the Medford Arts Council. 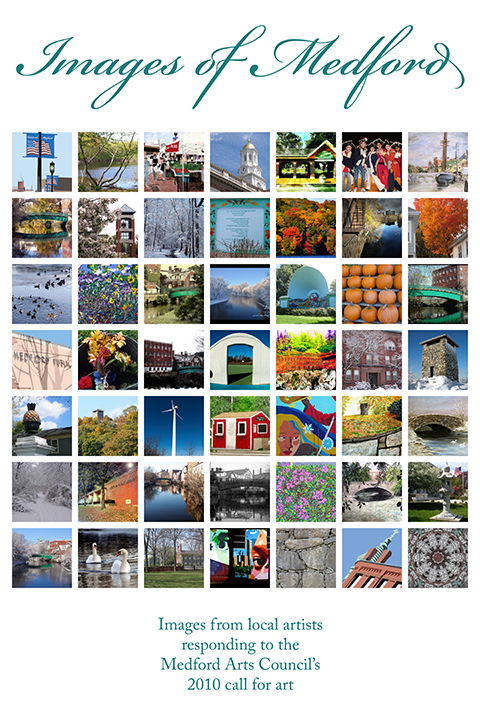 By creating these postcards, we supported and encouraged both amateur and professional local artists, we involved the community in choosing the postcard images, and we printed and distributed over 14,000 postcards featuring 3 different images of Medford. By having beautiful images on the front and a little information about the Medford Arts Council on the back, these postcards boosted community pride, improved awareness of our mission in our community, and gave us great publicity at each step. By sending them out in a city mailing, we also livened up the experience of receiving a water bill from the city. And we did all of this for less than $400! I wrote a call for art which we distributed all over town. We used flyers in public venues and email to our contact list and to local email discussion lists. 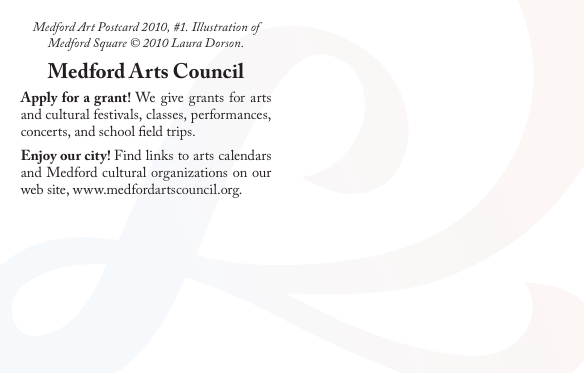 We also asked local artist groups such as Medford Arts Center, Inc. to distribute the call for art to their members, and sent press releases to local media. 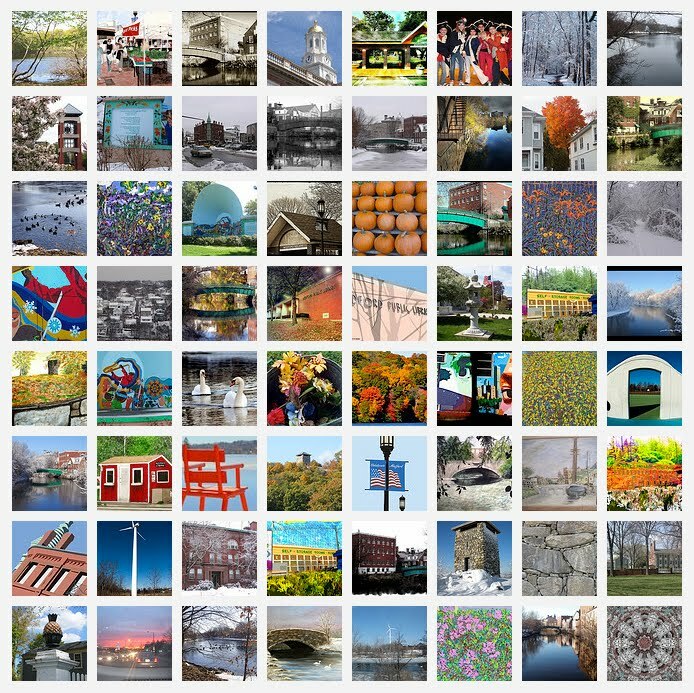 I also searched Google and Flickr for images of Medford so I could personally solicit submissions, and I contacted the artists for the images that I thought were most striking. One of those solicited images wound up becoming one of our postcards. For printed postcards, you want the digital image to be at least 300 dpi at final size, and you typically have to allow 0.1" of the image to extend (or "bleed") off each side where you want the postcard not to have a border. (The printer we used prefers 350 dpi and only needs 0.05" bleed on each side.) 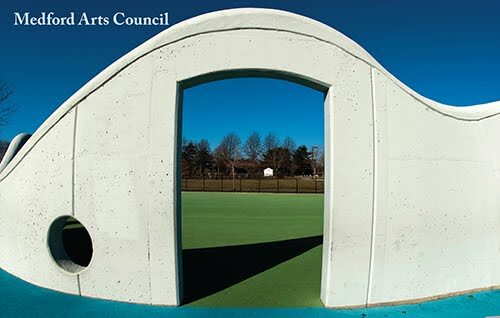 We originally planned to place "Medford Arts Council" over a solid stripe of color on one edge of the postcard. With the images we chose, it worked better to place the text directly over a corner of the image. We knew that we were going to mail out our postcards as an insert in the Medford water bills, and we wanted the postcards to be mailable on their own. This gave us a lot of constraints to consider for size and paper thickness: we had to take into account USPS requirements and the limitations of the water bill mailing provider. We settled on a 3.5"x5.5" postcard, slightly smaller than a typical 4"x6" postcard. We decided not to charge a submission fee because we wanted as many submissions as possible, and we wanted to use the postcards to promote local artists rather than try to make money off of local artists. As each image came in by email, I wrote back confirming that we had received the image and put the image in a folder. I renamed the image files with short file names, and kept an updated document with the file name of each image along with the artist's name and email address. Even if you are dealing with professional artists, not every image you receive will meet the specifications you provide. If the resolution was not high enough, I wrote back to the artist explaining that we would need a higher resolution version of the image. Not everyone is able or willing to provide that, and it's important to tag those images for yourself as not eligible for the actual postcards. There was a fair volume of email correspondence to all of the artists to let them know about online voting for images, to let them know when final selections were made, and to let them know that their images were on a poster on display in City Hall. Don't ignore the artists whose images are not chosen: a key goal of this project is to encourage people to keep making and sharing art, and you want them to submit images in the future. After the deadline had passed, we had received 64 images. The majority were photographs, but we also received images of paintings, illustrations, digital art, and even a woodcut. I created a collage of all of the images and chose 19 individual images to use for online voting. The editor of the Medford Transcript offered to host the online voting, and set up a lovely online gallery and poll. They also printed the collage in the newspaper. Within a week, there were more than 200 votes with 5 or 6 clear leaders. We chose the final images to use as a group during our next meeting. I posted all of the images in a private Flickr group before the meeting so that council members could look through the images online, and I printed all of the images at Costco's Photo Center as 4x6 photos (approximately postcard size) so we could have actual printed images to look through during the meeting. At the meeting, we spread out all of the photos on a table, and everyone chose the ones they wanted to consider and moved them aside. The remaining ones were removed. We then each used 3 post-it tags with our names on them to vote for our favorites (you could put all of your tags on one image if you wanted). We also used an additional tag for the winners of the online voting. As we removed the images with the fewest tags, anyone with a tag on a removed image could move their tag to a remaining image. We did this in steps until we had just 3 images left. This was not a silent process. We talked about what we liked and didn't like in particular images, as well as our many considerations in choosing images: wanting striking images, images that represented Medford, images that reflected different aspects of Medford, and images from different artistic modes (photography, painting, etc.). One appealing and recognizable bridge was featured in 9 different images, and several of those images made it through the first several steps. Because we wanted a variety of images, once we agreed on a particular winter photograph of that bridge, we decided to set aside the other winter images and the other images of that bridge. In the end, our 3 winners were among the leaders in the online voting that the Medford Transcript had hosted. I printed 12"x18" enlargements of the winning postcard images, and we announced the winners and unveiled the enlargements at our spring reception. (I used Costco's Photo Center for printing the enlargements and then mounted them on wrapped canvas from Michaels Crafts.) We had good information about the artists and the images from the original submissions, and I did some further research to fill in some details about the subjects. We distributed our press release at the reception and to local media. I wrote a simple rights assignment form to obtain non-exclusive rights to create and promote the postcards. There are important considerations in doing this: keep the language of the rights form clear and figure out what you actually want the right to do. If you don't regularly deal with rights assignments, a book from Nolo Press is likely to be more helpful than your town attorney. We only had the winning artists sign this rights form. I used Photoshop to convert the winning images to CMYK and to then adjust the colors to match the original RGB submissions as closely as possible. I used InDesign to place and crop the images, design the postcard backs, and create the final PDF files of the postcards for the printers. The Post Office has strict requirements for mailable postcards in dimensions, paper thickness, and what areas on the back of the postcard must be left blank. The large graphic on the back of our postcards is printed at 7% opacity, which was the darkest allowed in the "blank" areas of the postcard. Always check the current USPS requirements before you print postcards. We printed 5000 each of 3 different postcards. We needed 14,200 for our mailing, and wanted some left over for later distribution. I used gotprint to print the actual postcards. Gotprint has a number of advantages in my experience: their prices are very affordable for long-run color printing (we spent less than $400 for 15,000 postcards), the colors are generally very close to accurate, they offer heavy paper stock and durable gloss coatings, and they offer a wide range of sizes. They also have some very significant disadvantages: they offer no hand-holding for setting up your files, their customer service is non-existent, and they offer no quality guarantees. If something goes wrong with the print run, you are unlikely to get your money back. In my last dozen print runs from gotprint, 9 print runs were great, 1 print run had unacceptably poor registration, and 2 print runs came out with the postcards or business cards curled. If you are not comfortable reading specs and setting up digital files for color printing, or you don't like rolling the dice on quality, you may want to choose a different printer. Printing prices vary tremendously for long-run color printing. As of February 2011, 5000 postcards can cost you $100 at gotprint, $160 to $400 at psprint, $400 at vistaprint, or as much as thousands of dollars at a local print shop. Shipping prices also vary quite a lot. Our mayor agreed to include the postcards in a water bill mailing, which goes to over 14,000 Medford households. The city covered the increased postage cost and any additional charge from the mailing service they use. We've done inserts in water bill mailings before to distribute surveys, and it has been a wonderfully affordable method to reach out to our community. All we had to do was talk to the mayor and his staff about our plans, and bring the printed postcards to the company that does the actual mailing. 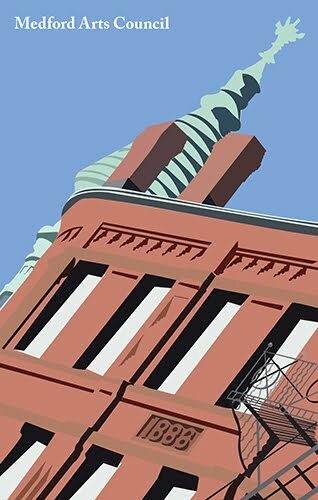 Boston.com published a lovely article about our postcards mailing, which was then picked up by Americans for the Arts as national news. I posted about all the excitement on the Medford Arts Council blog. I created and framed a poster titled "Images of Medford" based on a fresh collage of submitted images. We've displayed that poster at local events, and the mayor displayed it outside his office in the center of City Hall for a month. Our postcards are available for sale in the gift shop of the Royall House, a historic property in Medford. We also distribute them at events and offer them to donors. The Royall House liked one of our postcards so much that they hired the artist, Laura Dorson, to create two new postcards for the Royall House as well.